The magician shows two small bats or paddles. One of these has a spot on it , and the other is blank. 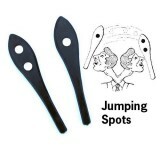 Both sides of the paddles are shown, one being completely blank, and one having a spot on each side.With a magic gesture the magician produces a spot on the blank paddle. Now one side has a blank, and the other side has a spot. Then he produces a second spot on the opposite side of the paddle, so that both paddles now have a spot on each side.He now causes the spots to jump from one paddle to the other. 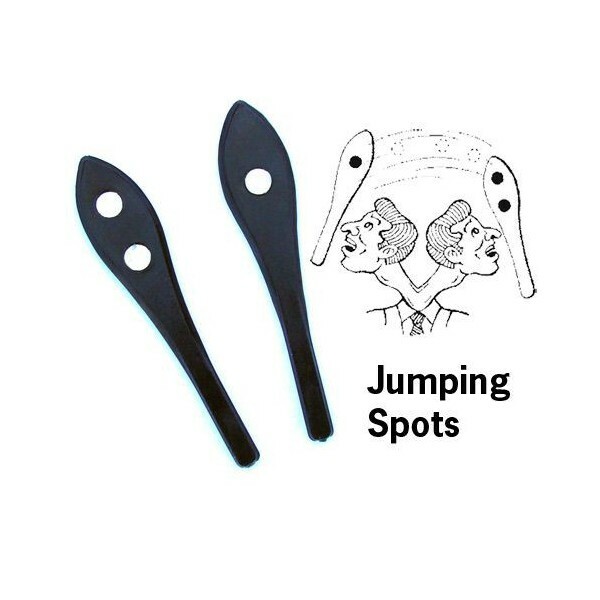 One of the spots jumps, and there are two spots on one paddle, and none on the other. This is repeated with the spot on the other side as well, so that one paddle has two spots on both sides, and the other is blank on both sides.The spots can be made to jump from paddle to paddle as often as he wishes.Finally the routine ends with one spot each on one side of both paddles, and two spots on the opposite side of on one paddle. The paddles can be handed out for examination if you wish. The apparatus supplied consists of the two paddles, with full instructions.